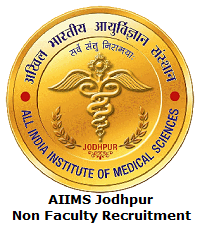 AIIMS Jodhpur Non Faculty Recruitment 2019 Notification is Released by All India Institute of Medical Sciences (AIIMS Jodhpur) officials for 110 Assistant Engineer, Junior Engineer, Medical Record Officer, Office Assistant, Stenographer, Personal Assistant, Private Secretary & Other Posts. Candidates who are looking for Non-Faculty jobs in AIIMS Jodhpur, they should utilize this great opportunity by applying for the AIIMS Jodhpur Non Faculty Recruitment 2019. For this recruitment, the application process started on 25th March 2019 and the application process end date on 23rd April 2019. Eligible candidates should apply for AIIMS Jodhpur Group B and Group C posts before the end date. Candidates can get Selection Process, Salary, Eligibility Criteria, Important Dates, Application Fee, Age Limit and Application Process details from this article. Furthermore, at the below of this page, we have given a link to download AIIMS Jodhpur Non Faculty Recruitment 2019 Notification. Here we had provided complete information about AIIMS Jodhpur Non Faculty Recruitment 2019. Candidates can check the eligibility criteria and apply for AIIMS Jodhpur Non Faculty Jobs 2019 quickly. The AIIMS Jodhpur authority had released notification for 110 Non Faculty (Assistant Engineer, Junior Engineer, Medical Record Officer, Office Assistant, Stenographer, Personal Assistant, Private Secretary & Other Posts). For these vacancies a massive number of candidates showing interest. So all the aspirants without any delay must apply for AIIMS Jodhpur Non Faculty Jobs Openings. To apply for AIIMS Jodhpur Non Faculty Recruitment 2019, candidates should have done 10th, 12th, Diploma, B.E, B.Tech, Graduation, Post Graduation, B.Sc, M.Sc, M.A, MCA. Candidates can also check the official notification know more details about the education qualification. All India Institute of Medical Sciences Jodhpur (AIIMS Jodhpur) home page will appear on the screen. Go to the Recruitment section which is at the left side of the home page. In that find AIIMS Jodhpur Non Faculty Recruitment 2019 and click on it. Read the details in the Notification, and download it. If you are eligible, then click on Apply Now Option. Fill AIIMS Jodhpur Non Faculty Recruitment 2019 application form and verify the information twice.